On Good Friday, I decided to be particularly punny and visit Fried and Fabulous. Fried. On a Friday. Good Fry. Day. 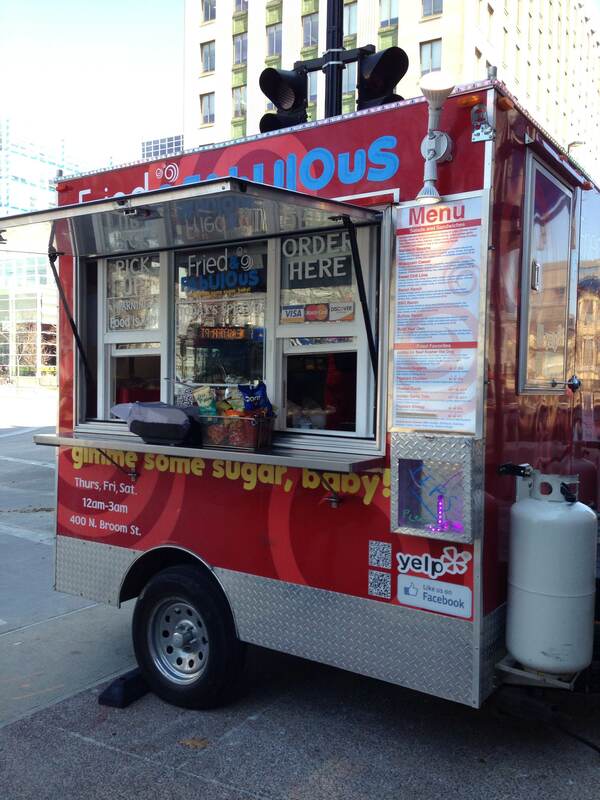 Fried and Fabulous is a food cart mainstay. They’re out all the time – late night, lunch, Farmers’ Market Saturdays. You really have no excuse not to visit. Their new 2014 lunchtime spot is on the corner of Main and King near Walgreens on the Capitol Square, in beloved Blowin’ Smoke Barbeque’s old spot. I asked many a coworker to go to lunch at Fried and Fabulous with me and was shot down. Will I be eating Twinkees for lunch? Are you kidding, why would I want a mound of fried stuff for lunch? The only one brave enough (and smart enough) to attend was Megan. I think it’s the name of the cart that turns the office dwellers off (not the college kids though, college kids would never mind that name). They’re missing out because the lunch menu is delicious, creative and yes, not extremely healthy, but it’s also not roll-around-in-gravy-then-deep-fry-a-Snickers levels of gluttony. I believe lunch can be an indulgence once in a while and Fried and Fabulous is just the place to partake in such a meal. Want a Caesar salad with cheese curds on top? Go nuts. A nice Mandarin Sesame sandwich with deep-fried mushrooms? I won’t judge. Megan and I settled on the Sweet Chili Lime salad with popcorn shrimp and the Bacon Ranch salad with popcorn chicken. And because the shrimp and chicken just wasn’t fried enough, I added an order of small cheese curds. You can get all the lunch options as a salad or a sandwich. The wait was short, about three minutes total for both of us as our items were prepared and freshly fried. Although, there seemed to be some kind of mix-up with my salad and the shredded cheese and bacon were added at the last second after the container was already closed up. But my meal ultimately was not lacking in cheese or bacon so no harm there. 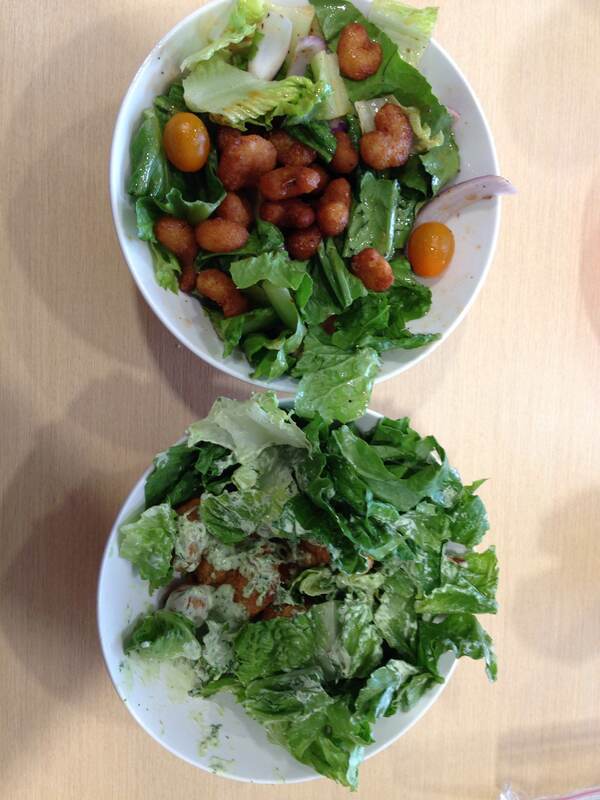 The salads were $7.50 each and the small order of curds (plenty for two people) was $4.50. Not overly priced for a lunch. The salads were really really great. Both delicious. Both filling. Both covered in delightful sauces.The curds were a nice side and the perfect amount of cheesy. Our only compliant with the whole meal: The lettuce was unruly. The chunks of romaine were big and sloppy and hard to eat and could have been given a chop or two before serving. That critique is perhaps the pickiest sentence I have ever written and clearly is the comment of two lunch-goers who order a lot of salads. Sorry. It was unruly lettuce! (EDITOR’S NOTE 4.23.14 Steve has assured me since they hand-cut the lettuce they’ll give it an extra chop or two to make the lettuce bite size. Cheers to the end of unruly lettuce!) The cart owner Steve even gave us tasty (FREE) chocolate chip cookies with our meals. 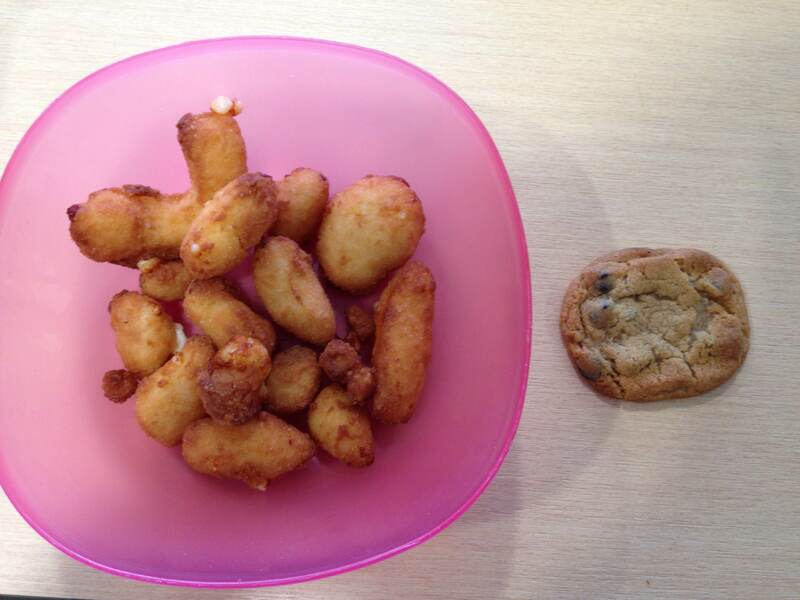 A dessert perfect for fried food salads with a side of cheese curds.